For weeks before our San Juan getaway my daughter asked daily, “How many sleeps until our vacation?” She danced around the house singing, “Puerto Rico…Puerto Rico!” She bragged to neighbors and waitresses about her impending trip with just mommy…no little brother, no daddy. This would be a special time for the two of us to talk, frolic on the beach, play games, and do other mother-daughter stuff. 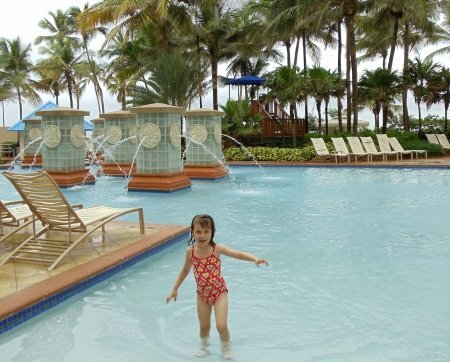 Despite the lengthy travel time (12 hours door-to-door each way from my home in San Diego), when I was invited by the San Juan Marriott to spend a few days at their resort with three other fabulous family travel bloggers and their children, I jumped at the chance! 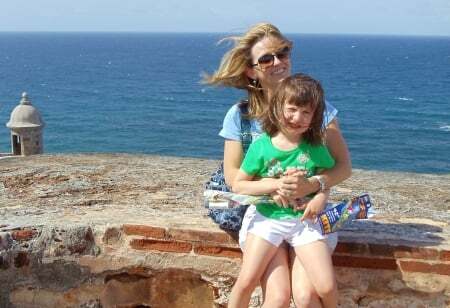 Here’s how to have a fabulous mommy-daughter vacation in Puerto Rico. If you’ve read some of my previous posts, you might know that I’m a sucker for great hotel pools (and not just because of my kids)! A zero-entry pool with shallow water and gorgeous waterfall fountains was a fantastic splashing spot for babies, toddlers, and kids of all ages. We spent most of our time in the main pool with its tropical flower mosaic-tiled floor. On our first day at the resort we tossed a beach ball back and forth and ignored the burgeoning droplets that had begun to fall from the sky. The closed waterslide taunted Karissa, who begged me to let her slide down it just once pleeeease despite its sign announcing “closed” (apparently due to rainy weather). We warmed up in the hot tub, although the sign posted clearly prohibits children under age 12 from entry. (Shhh…don’t tell!) Too soon, heavier rains forced us out of the water. Thankfully, a couple days later a sunny morning allowed for some all-out poolside fun! 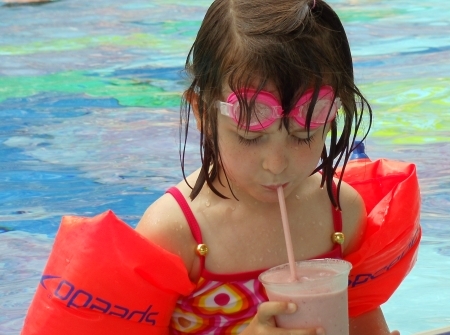 We swam with our friends before pausing for fruit smoothies at the swim-up bar. Finally, it was time for what every child-sized hotel guest had been waiting for…the waterslide opened! 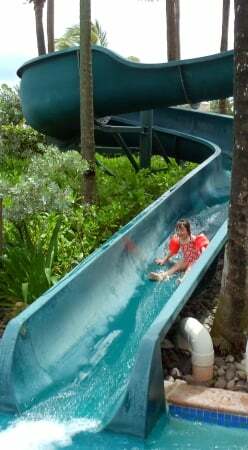 Children and grown-ups alike took turns zooming down the winding slide. I have visited a lot of resorts with fabulous pools and never have I experienced such joyous frenzy surrounding the waterslide! The lifeguard at the top egged us all on to “scream on the way down.” (My daughter took this directive quite seriously!) Truly, this was my favorite part of our trip. When you’re zipping down a waterslide, there’s no time to think about bills, or work, or to-dos…it’s just pure fun, fun, fun! As we drove past other hotels in the area, it seemed the San Juan Marriott had snagged the best beachfront location of the bunch. Its expansive stretch of sandy beach lined with lounge chairs and blue and white striped umbrellas was a wonderful place to laze away the day. What is there to do in San Juan when it’s raining? Not a whole lot, frankly. San Juan is where to go for a sunny getaway and typically rain is rare, especially during the summer. Thankfully, the kids didn’t seem to mind the rain a bit. Really, children just want to spend time with YOU, it doesn’t matter what the weather is. One day we were scheduled to visit the Rio Camuy Cave Park, which apparently houses a raging underground river. While this sounded intriguing our visit had to be canceled due to the rains. Instead, we went to Museo Historico de la Biblio, which reminded me a bit of the attractions in Las Vegas for children. 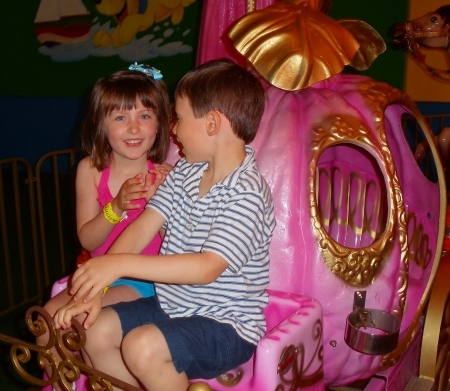 There were animatronic dinosaurs and wooly mammoths that roared if you feed them a couple of quarters, miniature golf, an indoor ice skating rink, kiddie carnival rides (the children’s favorite), an aquarium (the moms’ favorite), and a pizza place for lunch. I wouldn’t bother making a trip here if the weather is nice, but it certainly was an entertaining rainy day diversion for the kids. When all else fails, go out for ice cream! Another rainy afternoon Karissa and I walked to Haagen Dazs with Debbie (Delicious Baby) and her two sons, Elan (14 months) and Everest (five). 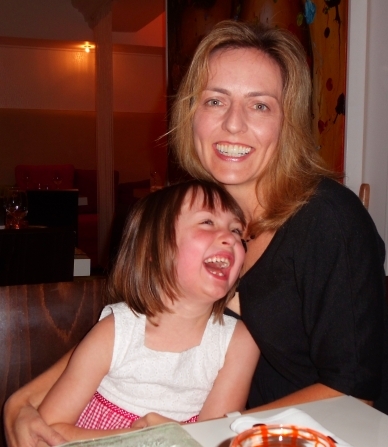 My daughter and Everest were quite smitten with each other, so they would have been happy wherever we went. My berries and cream cone, however, kept me happily distracted for awhile. Downtown, known as Old San Juan, was a charming, hilly area filled with pastel-colored buildings and cobblestone streets. There were horses clopping through town pulling families and couples in carriages, which looked like a delightful way to take in the sights. We didn’t have much time to explore but I did some serious speed shopping and purchased a Christmas ornament for the family, a pink quartz necklace for me, a small bottle of rum for daddy, and some adorable hair ribbons for Karissa. Puerto Rico’s best known fortress, El Morro, began construction by Spain in 1539. 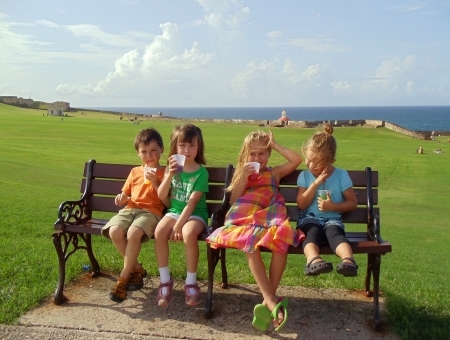 Before heading to El Morro, pick up a kite in town. After exploring the fort’s ramparts and taking in the sweeping views from its rooftop, take advantage of the windswept grassy landscape and soar your kite through the windy skies. Be sure to hold on tight to the string; poor Everest lost his kite to the wind gods and was quite inconsolable afterwards. Luckily a piragua (snow cone) was distraction enough to lift his spirits. It was awesome to have some undistracted one-on-one time with my little girl for a few days. On the airplane, we played a travel version of Hi-Ho Cherry-O and Zingo To Go, created Color Wonder Glitter princess pictures, read books, and watched videos. We splashed together in the swimming pools and rode down the waterslide together. Over meals, we discussed the merits of Mickey Mouse Clubhouse versus Caillou. No matter my travel partner, toward the end of most trips, I’m ready for a break from nonstop closeness. This was even (especially?) true when traveling with an adorable, sweet, loving, whining, fidgety, demanding five-year-old. After awhile, we ran out of cartoons, classmates, and candies to discuss. We sat in silence across each other at lunch in the airport during our layover on our way home. We’d had our fill of time, love, and attention. In time, though, I won’t remember those last draining 12 hours of travel. I will remember my daughter’s raucous laughter as I swung her through the pool’s water, her squeals of joy as she zipped down the waterslide, and the friendships we forged with the other traveling moms and their kids. Have you gone on a mother-daughter vacation? How’d it go? Let us know in the comments! A Note from the Travel Mama: My daughter’s and my flight, accommodations, and many other expenses for this trip were paid for by the San Juan Marriott. I always provide my honest opinions, regardless of who’s footing the bill. ThinkFun also provided us with a free Zingo To Go game. Such a special time for you and your daughter. I can see it especially from the last picture of how happy she truly is. This turned out great–it was so fun to finally meet you! It was such a great time for everyone but the mother-daughter time was priceless. I’m trying to think of a good term for separate family vacations… Sibcations? Kidcations? We went on a short mother-daughter trip in June to Horseshoe Bay here in Texas. It wasn’t a big trip–only an hour or so from where we live–but it was our first girls-only vacation. We had a blast, but my 3 year old daughter kept asking about daddy…I think it seemed strange to her that he wasn’t there. Overall, it was a good experience.